Yes this is real... very creepy and very real. 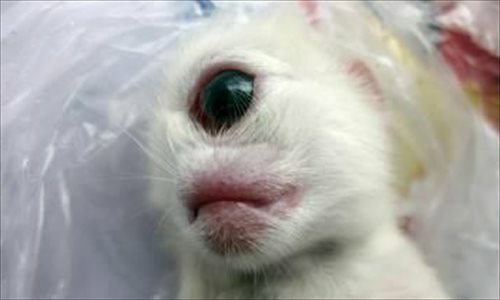 A kitten born with one large single eye and no nose died an hour after its birth late last week in Neijiang, Sichuan Province, West China Metropolis Daily reported. The Persian mix-breed white kitten was born at around 11 am on August 30 and measured 10 centimeter long, according to its owner surnamed Wang, a resident of Jiaotong Road in the city’s Shizhong district. Wang said the kitten passed away as he rushed it to a local pet hospital for treatment after noticing its odd appearance an hour after it was born. A veterinarian at the Binjiang Pet Hospital surnamed Zeng explained the kitten probably suffocated given it has no nasal cavity, the report said. Netizens remembered the one-eyed kitten with the usual emoticons, while some commented it resembled the Chinese semi-mythical folk hero Erlang, who has a third truth-seeing eye in the middle of his forehead. Photos and videos of kittens born with similar birth defects circulated online since 2005, such as “Cy” and “Cleyed the Cyclops” in 2009, both of which were first met with skepticism but were later proven to be authentic.